It is officially fall y’all! The leaves are changing color, the weather is turning colder and Thanksgiving is just around the corner. Fall is, without a doubt, my absolute favorite season of the entire year and although Christmas ranks #1 on my favorite holiday list, Thanksgiving comes in at a very close second. Nicholas is just starting to understand holidays and how they work and even though he started Halloween a little nervous and shy, by the end of the night he was loving it. For Thanksgiving though, I really want to try and get him excited about the holiday. However, in my quest to create a fun new turkey activity or two, I got a little carried away. What can I say, I think I was having just as much fun, if not more, creating them than Nicholas will actually doing them. Oh well, my creation spree just means another free printable for you guys and that’s always a good thing right? Well today you’re gonna get more than just a free Thanksgiving printable. Today you’re getting an entire Thanksgiving Preschool Pack that is perfect for both toddlers and preschoolers! That’s right! 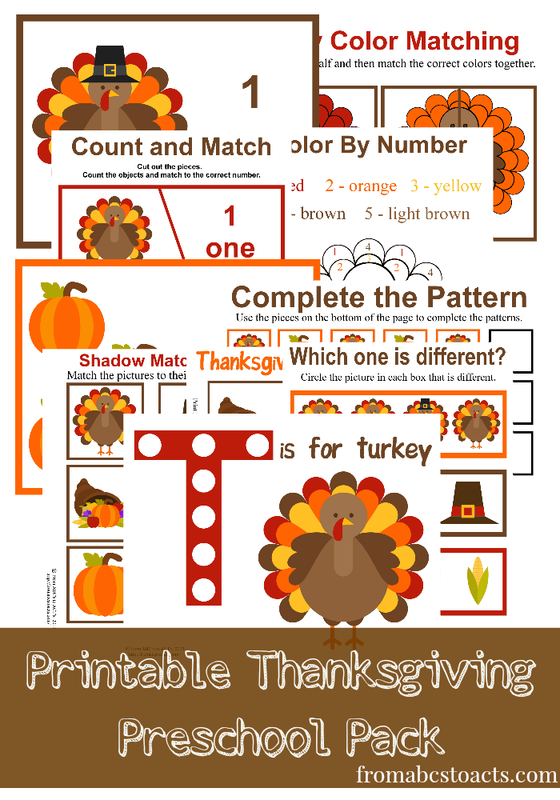 Over 35 printable Thanksgiving activities in one pack, just for you! Just click the picture below, print and enjoy!